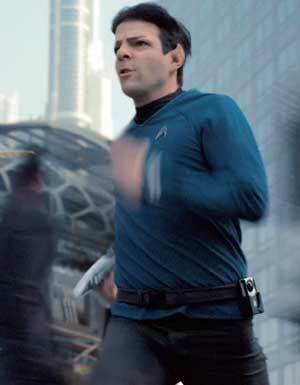 Hold up a mirror to STAR TREK II: THE WRATH OF KHAN and you get – STAR TREK: INTO DARKNESS. We get Spock and his infamous line in the first ten minutes, “The needs of the many outweigh the needs of the few”; we get the crisis which can only be diverted by someone illustrating that infamous line by diving into the radioactive reactor room to fix the something-something and save everyone else except himself; and we get – in an issuance of lungbreath rather than a cheese-shout – “Khaaaannn”! Recall if you will the prime directive of this new STAR TREK franchise (helmed by J.J. Abrams): that these are the characters we know from the movies and TV series – as youngsters. But on a different timeline. So we can find them in almost the same situations, which are reworked to be infinitely more interesting, with much better efx, and with actual acting. 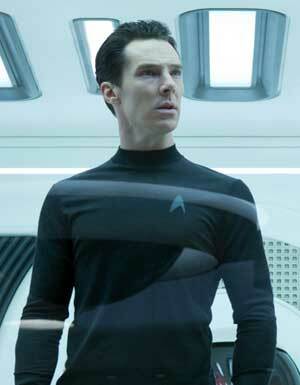 A genetically-enhanced stranger (Benedict Cumberbatch) launches attacks on Starfleet Headquarters, and the Enterprise is dispatched to terminate him with extreme prejudice while he is on a neutral planet. (Shades of Edward Snowden – before Edward Snowden even landed in the public eye.) But this stranger’s motivation is driven by blowback – created by Starfleet Admiral Marcus (Peter Weller), who is, of course, the person ordering his termination without a trial. Like STAR TREK VI: THE UNDISCOVERED COUNTRY, this movie delves into real world issues like preemptive strikes, drones, genocide and small-minded politicians who believe the best solution to any problem is to fire missiles at it. It’s no small joy to see the whole cast from STAR TREK 2009 reunited: Chris Pine is Captain James T. Kirk of the starship Enterprise (still impetuous insubordinate action man, with the perfunctory scene of him being chewed out by his commanding officer, Bruce Greenwood), and Zachary Quinto is First Officer Spock (logical liege to Kirk and action man himself in this outing). Karl Urban is still growling a mean Bones (“Damn it, man, I’m a doctor, not a torpedo technician!”), Simon Pegg is elasticizing English as Scotty – with a moral compass that he gets fired for, John Cho as Sulu gets to sit in the Captain’s seat and issue death threats (not bad for Harold! ), and Anton Yelchin as Chekov is still devouring hard consonants as he runs about the bowels of the Enterprise trying to do Scotty’s job. A gratuitous shot of Alice Eve – JUST LIKE IN THE MOVIE! Plot goes deeper as the stranger is revealed to be – exhale sinisterly – “Khaaaaan,” whom we felt the wrath of in TREK II, with his feather-haired, body-oiled brutes, yet here a clean-cut sympathetic figure, trying to save his people from destruction – his people who are all super-soldiers like himself and in hypersleep, in the very missiles that were ordered fired upon the neutral planet! “My crew is my family, Kirk, Is there anything you would not do for your family?” Enunciating like the upper class Brit that he is. (Remember when ALL villains were British?) This was obviously before he got his breast augs, feathered his hair, or spent that time in Guatemala and picked up that atrocious Fantasy Island accent. And the “neutral planet”? Kronos – the Klingon homeworld – oy, mok-tha! – where we meet the New Klingons for this franchise. They might look scary, but they’re about as lethal as Stormtroopers being pushed over by Ewoks. Oh, Heghlu’meH QaQ jajvam! Spock is especially featured as action man, rather than just geeky brainiac; his hand to hand battle with Khan atop a flying transport and subsequent full-tilt chase through city streets is Vulcan dynamite. And he also gets the most touching moment, as he mind-melds with his dying commander (a Grand Death performance by Bruce Greenwood). STAR TREK: INTO DARKNESS is an involving thriller that happens to be set in space. Double-crosses, treachery on both sides, unethical and honorable behavior on both sides, and lots of comedic flourishes and nudge-winks, with each character cementing their space within the TREK universe. I’m not a TREK fanatic, so I wouldn’t know how Trekkies are regarding this new direction, boldly going where no TREK has gone before – into a realistic world with solid characters and no campiness. Way beyond anything TREK’s creator, Gene Roddenberry, could have foreseen. Hold up a mirror to INTO DARKNESS and you will see THE WRATH OF KHAN. But the ham and cheese has been left back there on Fantasy Island. Writers: Roberto Orci, Alex Kurtzman, Damon Lindelof, Gene Roddenberry. Starring: Chris Pine, Zachary Quinto, Zoe Saldana, Karl Urban, Simon Pegg, John Cho, Benedict Cumberbatch, Anton Yelchin, Bruce Greenwood, Peter Weller, Alice Eve. Once again – in a space-based movie – my little green mouth is agape at the TOTAL IGNORANCE of, or IGNORING of, basic physics and orbital mechanics. I won’t even begin to question what is creating the ship’s internal artificial gravity. But one good thing: in this timeline, the Enterprise actually has SEAT BELTS! No more falling to the floor while Movie Sparks fly from the consoles of the hyper-advanced spaceship to indicate a malfunction and the camera tilts to indicate the ship is pitching and yawing. Now that’s Science!